It’s hard to believe another summer has passed and Thanksgiving is only a week away. I must say, this was not a great fishing season for me. It seems that this year there were too many interruptions that kept me very busy, not to mention the streams’ low water levels later in the summer. Unfortunately I spent quite a bit of this summer restoring my 1965 Sunbeam which was damaged when, by a freak accident, someone drove into and through my garage, not only destroying the side of the building but the back of the car as well. My insurance rep found it quite funny when I first described it to her, especially when I told her that the car was “safely” parked inside the garage… Fortunately, no one was hurt and it was a good excuse to do an almost complete restoration of the vehicle since it was last restored over 20 years ago. 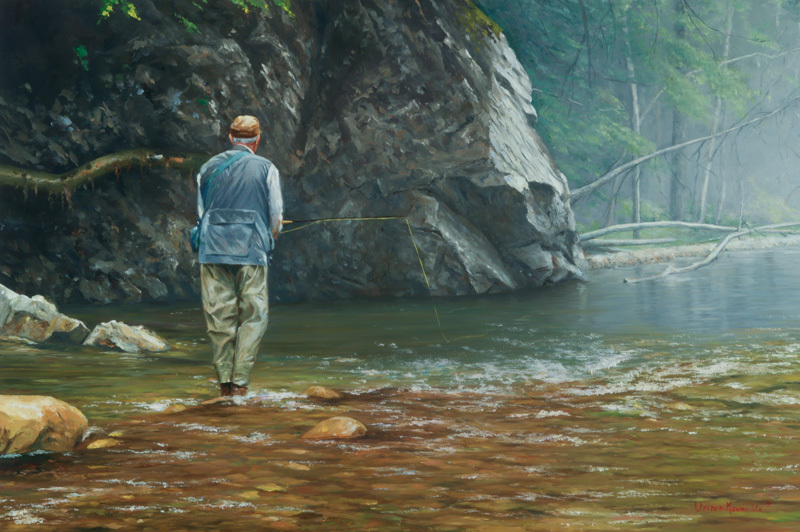 But in-between everything, I did manage a few days on the water in Vermont and the Adirondack mountains and I just completed an oil from one of these outings. The inspiration for In The Deep Cut came to me on a damp day with a slight drizzle. The fog was slowly dissipating and the sun was starting to break through. Everything sparkled from the rain and I tried to capture that moment. You will probably notice that this painting has a little different feel from previous ones. In a combination of techniques, I used detailed and loose brush strokes to recreate the light transition on that ephemeral moment. I’m really happy with the end results and I’m now confident that I have achieved that goal, since American Angler‘s Art Director’s Wayne Knight has selected this very image to be used for a spread in the January, 2016 issue of that great publication. I hope you’ll get to check it out.